The patient wait is coming to an end. At long last, season three of "Orange Is The New Black" arrives Friday. And I gots to learn what happens next. 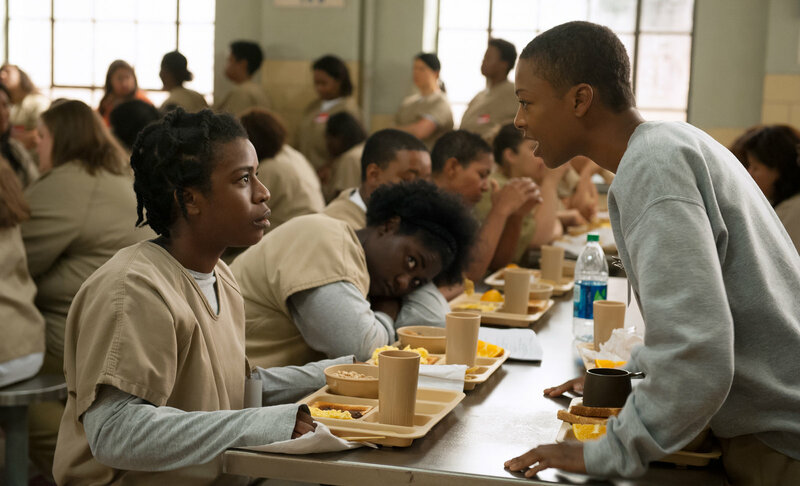 On this "OitNB Eve," during lunch I took some time to review the final episode of season two just to get reacquainted with the cast members who are at once familiar but have not been top of mind in 11 months. Though not surprising (given the blitzkrieg of entertainment news stories that appeared on newsstands and online this time last year), "Orange Is The New Black" preview reports are sparse compared to 2014's buildup to season two. Not even the Netflix series' Emmy winner Uzo Aduba (a.k.a. "Crazy Eyes") got much press in recent weeks (her NPR interview last year is a great intro to this amazing actress). According to this February 2014 interview during the Sochi Winter Games, Aduba practiced Olympic-style figure skating for more than 10 years (a skill she showed off sans stunt double in the show's first season). NPR did tease season three with a Weekend Edition segment. Last season's dark comedy will be tough to surpass. I found Piper's airplane monologue to be moving in a creepy-cool way; the tearful confession was performed by Taylor Schilling, born on July 27, 1984, the eve of the Los Angeles Olympics. She went there there and it was awesome! I'm glad to see Piper's seatmate Lolly (Lori Petty) returning for the new season -- she's got the anger issues thing down. It will be fun to see what the recently promoted "Beer Can" warden and "Pennsatucky" (Taryn Manning) bring to prison. And who knows where Suzanne (Aduba) will go from the dramatic lows of season two's conclusion? I would bet money that "Pornstache" has at least one cameo this season; if not, "That's a shot!" And if the devotional candle-infused promotional materials provide a sign of things to come, viewers may get to know some of the Hispanic characters con más detalle. Netflix announced Season Four will be produced for a 2016 debut, just in time for the summer of the Rio Olympics. Until then, I look forward to the cell block tales of season three. Post-binge-watch update (June 14, 2015): Turns out this season of OitNB unveiled an additional Olympic connection. As viewers learn in his back story, (spoiler alert) Caputo competed as a state-ranked high school wrestler. Later, during portrayal of his first day on the job at Litchfield, Caputo is drawn in to an Olympic wrestling match as the TV room is showing a binge-watch session of the Games. The Olympics are everywhere, even at Litchfield.